I want to talk more about something that I touched on in my blog entry about Fable III that was my first post here at DH: in medias res storytelling in games and how the device so rarely accomplishes what it’s meant to. For those unfamiliar with the term, in medias res (Latin for “in the middle of things”) refers to a narrative device wherein a story begins in its second or third act (or partway into its first act). 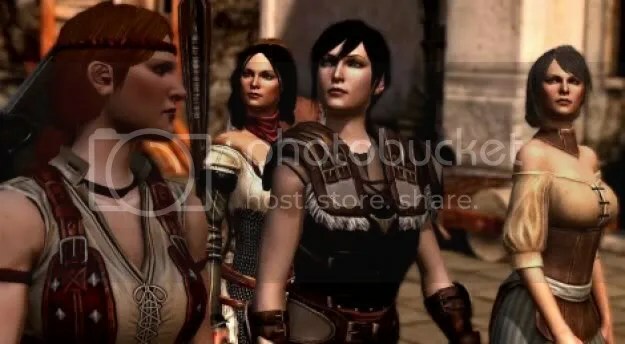 Dragon Age 2 is probably the most recent example of a game using in medias res, as it picks up midway into the Hawke family’s story. Their peaceful time in the village of Lothering leading up to the Blight and the Darkspawn’s attack on the village all occur before the start of the game, which catches up with the Hawke family mid-flight during their escape. This technique is employed often by game designers because it allows them to get right to the action. According to traditional three-act story structure, the first act consists of a calm, gradual introduction to the protagonist’s life and world. The introduction of conflict generally doesn’t occur until towards the end of the first act, when the protagonist’s happy little life is reversed.